Perhaps no other flower is as closely associated with a country as the tulip is with the Netherlands. This is understandable, since the tulip is an important part of the economy of this low-lying country located just off the North Sea. Each year, the Netherlands produce over three billion tulip bulbs for export and domestic use. The United States remains the top importer of tulips and receives one billion of them annually from the Dutch. In spite of its close association with the Netherlands, the tulip is not native to that country and has an interesting history. The word “tulip” is thought to be a corruption of the Persian word toliban, or turban—the headgear worn by certain Mid-Eastern people. Tulip probably is native to the Tien-Shan and Pamir Alai Mountain Ranges of central Asia near the modern day city of Islamabad, close to the border of Russia and China. From this region tulips spread to the east, west and northwest and were widely grown in the Ottoman (Turkish) Empire by the year 1000 A.D.
A noted botanist by the name of Carolus Clusius is credited with having planted the first tulips in the Netherlands in the year 1593. Clusius was very stingy with his tulips and saw their value only in scientific terms; he refused to give bulbs away or even sell them. Evidently, a group of frustrated would-be buyers paid an unannounced visit to Clusius’ garden one day and stole a part of his collection. Thus began the Dutch tulip industry. Tulips became highly sought after in the Netherlands because of their beauty and rarity. Tulip bulbs commanded fantastic prices and only the wealthy could afford them. They quickly became a status symbol and wealthy Dutch and European aristocrats paid huge sums for them. One early 17th century bill of sale recorded the following transaction for a single bulb: “two loads of wheat; four loads of rye; four fat oxen; five swine; twelve sheep; two hogsheads of wine; four barrels of beer; two barrels of butter; 1,000 pounds of cheese; a bed with linens; a suit of clothes; a silver tankard and a sizeable wagon to haul it all away”. What followed was a period of speculation called “tulipmania”. Tulip values raised on a daily basis and were quoted like stocks are today. Speculation in tulips ran wild as people purchased bulbs for outrageous sums with the hope of selling them for even more. As a result, many individuals suddenly became wealthy, fanning the flames of speculation even more. In 1637 the bubble burst and tulip trading crashed. Clearly, the price of tulips had elevated to many, many times their actual value, like an over-valued stock today. Some prudent speculators decided to sell their bulbs and reap the profit, causing prices to start to fall. Tulip prices fell rapidly as everyone tried to sell their tulips for fear of losing even more money and, before long, panic and pandemonium set in. Attempts by the Dutch government to moderate the crash failed and people wealthy because of their tulip holdings one day became paupers the next. Tulipmania is still used today as a classic example of what can happen when speculation goes bad. Darwin. This popular late-flowering group bears large oval or egg-shaped flowers usually square at the base with rounded flower segments. Darwins come in a variety of clear, beautiful colors and are borne on graceful, stately plants with straight stems to a height of nearly 30 inches. Darwin hybrids. This exquisite group of tulips is known for its huge, brilliant flowers borne on stout, two-foot stems. Bloom time varies according to the parentage of the hybrid giving this group an extended bloom period. Flower shape is much like the Darwins. Triumph. These are tulips derived from crosses between single-flowered early types and late flowering kinds. They bloom earlier than the Darwins and have shorter, heavier stems. Lily-flowered. This group possesses graceful, lily-shaped blooms with long, pointed flower segments. They combine beautifully with other plants and have a bloom period about the same of that of the Darwin hybrids. Cottage. This exquisite group can be traced back in parentage to older varieties growing in European countries other than the Netherlands. Their flowers are long, oval or egg-shaped and often have pointed flower segments. They are about the same size and height as the Darwins. Rembrandt. The flowers of this group closely resemble the Darwins with the exception of the color breaks (streaking) in the flower segments. Now genetic in origin, the first Rembrandts were thought to be streaked because of virus infestation. Parrot. This group of tulips exhibits the most novel flower form of any of the tulips. Individual blooms are large, long, deeply fringed and ruffled; they also often are striped, feathered and flamed in various colors. Bloom time typically is late. Double. Sometimes referred to as peony-flowered, this group has large double flowers that bloom late in the season. Individual blooms often measure four inches across and are borne on 6 to 12 inch stems. The group can be further sub-divided into early and late types. October is an ideal time of the year to plant tulips in Missouri. Whatever the group or cultivar, tulips perform best when grown in full sun and tolerate a wide range of soils, as long as drainage is good. Before planting tulips, the soil should be spaded/tilled to a depth of about 12 inches and amended with organic matter. Bulbs are usually planted 2½ times as deep as they are wide and spaced between 4 and 8 inches apart, depending upon cultivar. Tulip bulbs appear to be a favorite food of field mice, voles, gophers and other rodents, especially during winter months. To guard against damage some gardeners go to the trouble of planting each bulb in a small mesh cage fashioned from hardware cloth or welded wire. Unfortunately, tulips do not thrive in hot climates and do not naturalize in Missouri as readily as some of the other spring bulbs (e.g. Narcissus). Therefore, tulips frequently are treated as annuals in our state. They are planted in beds for early spring color with the intent of replacing them with a summer annual for color the remainder of the growing season. Although tulip bulbs may be saved from year-to-year, they usually decline in vigor and bloom quality each year. Tulip is a member of the lily family and is closely related to onion. 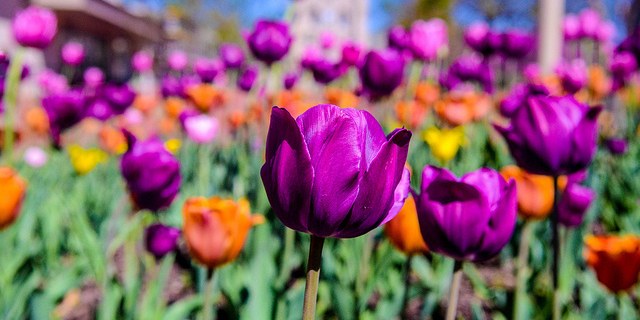 There are over 150 different species and 3000 varieties of tulips. Tulips were once the most expensive flower in the world. In the 17th century they cost more than 10 times the average worker’s annual salary. Tulips bloom in the spring for only three to seven days. During the Dutch Famine era of World War II, many people in the Netherlands sustained themselves on a diet of sugar beets and tulip bulbs, even though the latter are considered poisonous if not prepared properly. Tulip is the only cut flower that continues to grow in the vase, often adding up to three inches to its original length.